Radio DockDogs Episode 73 is available now with a fantastic episode featuring interviews with Tina McLaughlin from the B.A.A.R.K. 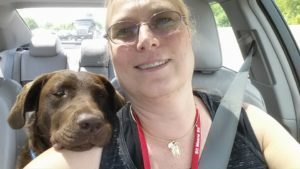 Foundation, Inc.
Radio DockDogs Episode 53 rolls in with a ton of fun with two fun and passionate ladies leading Tidewater DockDogs in Virginia to High Flying Heights! Jim Zelasko has a chance to speak with Ashley Rogers, President of Tidewater DockDogs and Rules Committee Member and their new Vice President Gwen Mowery! The two handlers interviewed on today’s Radio DockDogs program are extraordinary examples of the passion and dedication to DockDogs, canine companionship, finding dogs homes from rescues, and lifelong friendships that are so commonly found in DockDogs Worldwide programs. Tidewater DockDogs has a unique event coming up May 24th and 25th in Goodview, VA K9’s in the Vines that we’re excited to share about! While this is a pond event it will feature Speed Retrieve, Extreme Vertical, Big Air and Iron Dog — a unique and exciting opportunity not normally found at a pond jump! With so much information and great stories to share we’ll leave it to Jim, Ashley and Gwen to share their stories themselves — we’re sure you will enjoy! We are excited that the 2014 DockDogs® season is underway. The B.A.A.R.K. Foundation has spent the past few months brainstorming fundraising ideas to introduce & implement this year! Since the 2nd DockDogs® Regional Championship competition of the year is quickly approaching, we wanted to get the ball rolling with our first fundraiser of the season. Since the B.A.A.R.K. Foundation was originally conceived in order to help members of the DockDogs® community in times of need, and the DockDogs® community has been shown overwhelming support from the B.A.A.R.K.Foundation over the years; this year we wanted to really show off how connected we all are and to reinforce that in struggling times and hardships, that you have someone here to lean on. Or in our case, an entire nationwide community! For the 2014 season, we want to build a Caring Chain. Our Caring Chain will represent those we have loved & lost, those we love currently and want to recognize, and those who we wish to send love to overseas. A custom message can be written on each link, dedicating the link to someone special. Friends, family, and spectators can purchase a chain link for $1.00 per link and the links will be connected and displayed at that current event. But that’s not all… At the DockDogs® 2014 World Championship event, we will connect all of the Caring chains we have collected from the various 2014 DockDogs® events and display our Grand Caring Chain proudly, for everyone to see. Proceeds from each link will go to the B.A.R.R.K. Foundation to help DockDogs® members in need. As a special thanks, the DockDogs® Club that sells the most links this year will be rewarded with their affiliation fees for 2015 paid in full by DockDogs® Worldwide. So rally your club members and show everyone how much you care about your friends, families and fellow DockDoggers! Help us build a chain that stretches beyond our imagination, showing those that you love – human and furpanion alike – just how special they are to you, and in doing so you will be supporting the efforts of the B.A.A.R.K. Foundation in its mission to help those in need within the DockDogs® community. The links are available for clubs to purchase and sell at events, practices or socials at a cost of $1/link, throughout the 2014 DockDogs® Season. Please contact Teresa from the DockDogs® office at [cryptex]office@dockdogs.com[/cryptex] to place your order or for more information. You can write a check (made out to BAARK Foundation) and mailed to the DockDogs office (5690 Wolff Road Medina, OH 44256) or pay over the phone using a credit card, whichever is easier. Please get your orders in as soon as possible and no later than 10 working days before your event start so we can get the orders processed. Links will be sold in bulk and arrive with the DockDogs Admin at your event, if ordering outside of an upcoming event DockDogs will mail the wrist bands to the address provided at time of order. Please encourage your club members to sell the links. It may help to have a volunteer head up the operation so that your club members have a go-to person for questions or to obtain more links. The links and money raised can be turned into the DockDogs® administration person at the end of your event and will be forwarded to the B.A.A.R.K. Foundation on the Club’s behalf. If a club wishes, they can collect their chains throughout the season and bring them to World’s or send them with a representative of that club as opposed to sending them to BAARK after each event; which would allow clubs to create caring chains at all club functions outside of an event where there would be an event package returning to the DockDogs office. Please order in lots of 25. You can mix & match the colors for every 25 ordered, make sure to order sooner than later to get the colors of your choice while they last.